Our conversation with Chris is joined by the editor of the UC Food Observer, Rose Hayden-Smith. As we wander through the orchards we learn about figs, lemons, avocados, global trade, water stewardship and about soil that is far better today than it was when the land was Spain’s. Farm to Table means different things to different people but many would agree that restaurants and their chefs have led the way on our Farm to Table journey. Chefs might say that they have been led by their own customers who have shown a preference for food with a story all the way back to the farm: the farmer, unique varieties or breeds, production practices and overall sustainability. 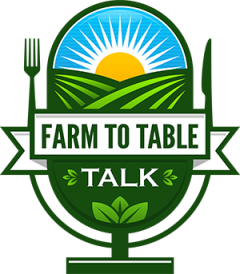 In this episode of Farm To Table Talk we are joined at the table by Greg Drescher, the Vice President of Strategic Initiatives and Industry Leadership with the Culinary Institute of America (CIA) to explore what Farm To Table means in the Culinary world and the trends that change menus. All over the country there are pockets of struggling neighborhoods who are working to improve their situations. Increasingly food production is central to these community efforts to pull themselves up by their bootstraps. The Yisrael Family Urban Farms is in the middle of one of those underserved communities where 17% are food insecure, 46% receive food assistance, 34% are below the poverty rate and 18% are unemployed. Chanouk and Judith Yisrael started growing food for themselves before gaining approvals to establish a community garden in a closed elementary school. From this beginning they expanded into a an urban farm on a lot across the street and are helping their neighbors learn to grow and to cook food for their own families. Today their advice is sought from all over the US and as far away as Italy. 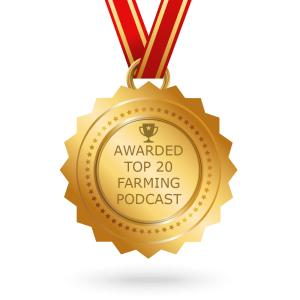 They share their inspiring story to help their own family and their community on Farm To Table Talk. More and more we want to know where are food was produced, what farming practices they followed, who are the farmers and are the farmers and workers along the way treated fairly. That’s easier if the farmer is your neighbor, but what if that farmer is half a world away? For many products, such as cocoa or coffee, there are no local grower options. Our guest today on Farm To Table Talk, Emily Benson works with cocoa farmers in the Congo and Peru to positively impact social, environmental and farmer profitability outcomes. Emily is the supply chain impact manager with Theo Chocolate, a Seattle- based chocolate company that is committed to ethical production from bean to bar, placing equal importance on people, planet and profit. Sometimes local produce is available, but most of the time it’s not due to the seasons. 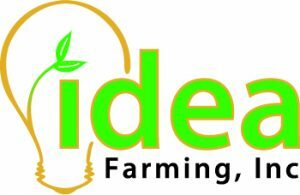 There is a new brand established to change that by growing local, perishable produce for area retailers in hydroponic green houses year round. Neal Parikh of Bright Farms explains how they are sustainably achieving a goal of decentralizing Agriculture– vertically building, owning and operating hydroponic greenhouses throughout the MidWest and East Coast for Supermarket partners. As much as consumers want to take advantage of lower costs for their food, there is certain amount of anxiety about “Big Food” or “Big Ag”, globalization, Wall Street, industrialization, “Big Government”. Trust is hard to come by for large brands and one of the biggest retail brands in the world is Walmart. It’s a company that keeps surprising the skeptics as it takes big steps to influence sustainability through their own supply chain all the way from the farm through the products they sell at retail and even to the use of the products that they don’t sell. To share some perspectives on what they do, why they do it, and to what effect Farm To Table talks with Eileen Hyde, the Walmart Foundation’s Director of Hunger and Healthy Eating. Some would say that Farm To Table started 50 years ago when Alan Chadwick established the Organic Garden at the University of California at Santa Cruz. That Garden led to one of the first bona-fide Organic Farms and over the past 50 years has propelled a food movement. 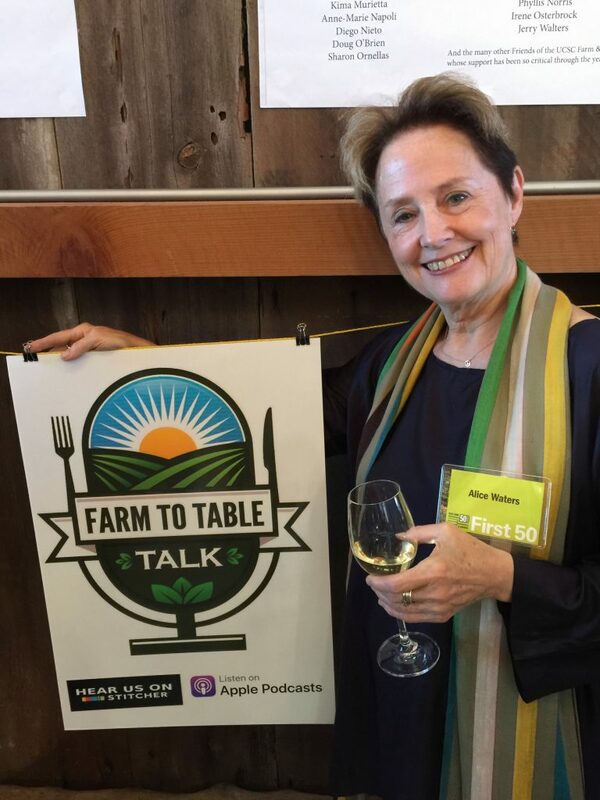 This episode of Farm To Table Talk is at UC Santa Cruz, where its Center of Agroecology and Sustainable Food Systems celebrated the 50th Anniversary of the Farm & Garden. Fittingly, illustrious former apprentices, students and long-time supporters gathered to reflect on the impact this program is having on the world of food and to be challenged to take it to the next level. Three keynote Speakers at the Conference share their vision, their passion and what they ask of us. We lead off with a conversation with Karen Washington, a recognized Food Justice leader and co-founder of Rise & Root Farm and Black Urban Growers. Then a self-described descendant of slaves, farmer, chef and proud alumni of the Santa Cruz apprenticeship, Matthew Raiford says we can be the change that’s needed. And finally in her remarks from the podium, the world-renowned food movement leader, founder of the Edible School Yard and creator of California Cuisine, Alice Waters give us a bold goal for Farm to School that could be accomplished in 5 years. Join this Farm To Table Talk at UC Santa Cruz in a conversation with Karen Washington then become part of the audience as you hear calls to action from Matthew Raifford and Alice Waters. Well told stories about farmers and farming are few and far between. Too often those stories are dry and boring documentaries to the general public. You can’t say that about the movie, Pray for Rain. Where documentaries preach to the choir, this movie instead wraps a message in to a very entertaining murder mystery, down on the farm. The star, Annabelle Stephenson; writer Christina Moore; and director Alex Ranarivelo join Farm To Table Talk to share what they learned in farm country while making this film and why telling stories better is critical if we want the public to care about what’s happening down on the farm.